FULLY AUTOMATIC SWING DOORS CAN BE USED FOR MANY DIFFERENT APPLICATIONS FROM HANDICAPPED ACCESS IN YOUR HOME TO HIGH TRAFFIC RETAIL OPERATIONS, AND THEY ARE SUITABLE FOR BOTH INDOOR AND OUTDOOR SETTINGS. At BBG BC we can install automatic swing doors to a high standard, keeping warm air inside and cold air outside during winter and the opposite during the summer. Manual Doors are often left open, wasting valuable energy, so automating these doors and using smart controls can ensure your doors stay open when in use and remain closed when not in use. The control operators we fit are extremely reliable and efficient, minimising your energy consumption, and fast door operation ensures minimum disruption to inside air temperatures. Automatic swing doors require at least 1 annual service in order to comply with Canada Standards. During this service, a safety check will be carried out by one of our authorised technicians. We can also offer preventive servicing and maintenance on a contracted basis or reactive servicing and maintenance on a non contracted basis. Our planned or preventative servicing and maintenance is undertaken on a contracted basis. All contracted clients receive a discount on materials and call-out charges. If you require an engineer to attend and give you a free quotation for a service contract please call or email our office. Swing door operators are advantageous for automating new or existing swing doors to buildings to give access to able bodied and less-abled people while keeping the original fabric of the building in place. This is ideal for listed or preservation-order effected areas. This operator also lends itself to the automation of fire doors which can be heavy and difficult to open for some users. The swing operator is often used successfully on the high street in many locations such as Building societies and Banks. Other users of this operator type are hospitals, colleges, universities, pharmaceutical manufacturers, and health centres to name just a few. The door leaf can be opened manually or by a touch pad local to the door. Better still we can install a movement detector fitted in place of the touch pad ,this will then give hands free entry or exit through the door. With the addition of door mounted safety sensors and barriers ,the public are protected from coming into contact with the moving door leaf. There are many different varieties of automatic swinging doors. They can be single leaf, double leaf, fully automatic, or low energy. They can be installed as new, yet most existing doors can also be modified to become automatic swing doors. Automatic swing doors may appear simple. After all, surely it is simply a case of ensuring that the doors open and close at the right time? Unfortunately not. There are many factors to take into consideration when designing and installing automatic swing doors, such as weight, width, and the speed and force with which the doors open. For this reason, you should always use the services of trained professionals when considering automatic swing doors for your premises. Why take the risk of installing an unsafe and unreliable system? Avoid cutting corners, and instead depend on the extensive knowledge and experience of Automatic Access. Why Use Automatic Access for Your Automatic Swing Doors? We are an independent company, which means that we are free to choose from the highest quality products from the world’s leading manufacturers of automatic swing doors. We have therefore been able to develop deep and varied product knowledge of the entire automated door market. This enables us to treat every project on its own terms, only ever choosing the products and accessories that we know will be right for your specific requirements. 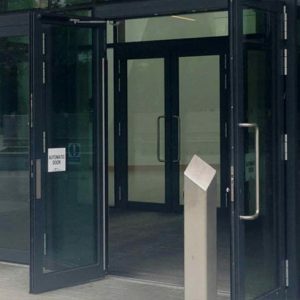 At Automatic Access, we can plan, specify, design and install bespoke automatic swing doors in accordance with the latest safety standards, providing you with years of low maintenance, easy access. To find out more about how you could benefit from automatic swing doors, please do not hesitate to get in touch. BBG offer free site visit with estimate for all installations of automatic doors. For more information, give us a call on 1-888-224-8688, or contact us via our online form. The automatic swing door comes in many varieties. The automatic swing door is very versatile in that the doors can be installed in existing door structures. The swing door in can installed in a single or double-leaf configuration. The doors are available in low-energy and automatic models.